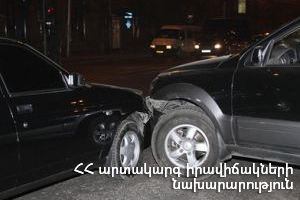 On February 11, at 21:12 information was received to “911” service that a car accident had occurred near Armenian State Pedagogical University after Khachatur Abovyan in Khanjyan street, Yerevan: the rescuers’ help was needed. It turned out that “Opel Astra G”, “Mercedes C” and “Opel Astra G” cars had collided. Before the rescuers arrived at the scene H. M. had been hospitalized to “Erebouni” medical center, A. H. (born in 1962) and Sh. G. (born in 1947) - to “St. Gregory Illuminator” medical center, G. G. (born in 1974) - to “Heratsi” hospital complex N1. According to doctors A. H. and Sh. G. were in serious but stable condition, G. G was in satisfactory condition. H. M. receiving necessary medical aid was discharged. The rescuers closed the gas valve of “Mercedes C”.